novaPDF (any edition) allows you to set auto-save options for the generated PDF file, so that once you hit Print and select novaPDF the resulting PDF will automatically be named in a particular way (set by you) and saved to a location you've set in novaPDF's Printing Preferences. In novaPDF's Printing Preferences window go to the Save tab. By default Prompt Save As dialog is checked, which asks you every time before creating the PDF where you want to save it and what name to set. the name of the PDF files in the File name field. You can also use the Macro button that will show you some valid tags you can apply to the PDF. By default [N] is in there, which will name the PDF file using the name of the document it was created from. Example: say you want to create daily reports, if you enter in the File name field report[YMD], the resulting pdf filename will contain the date after the word report - report20080620.pdf (the word report, followed by year, month and date). There are more tags in there you could use to automatically set a name for the resulting PDF. 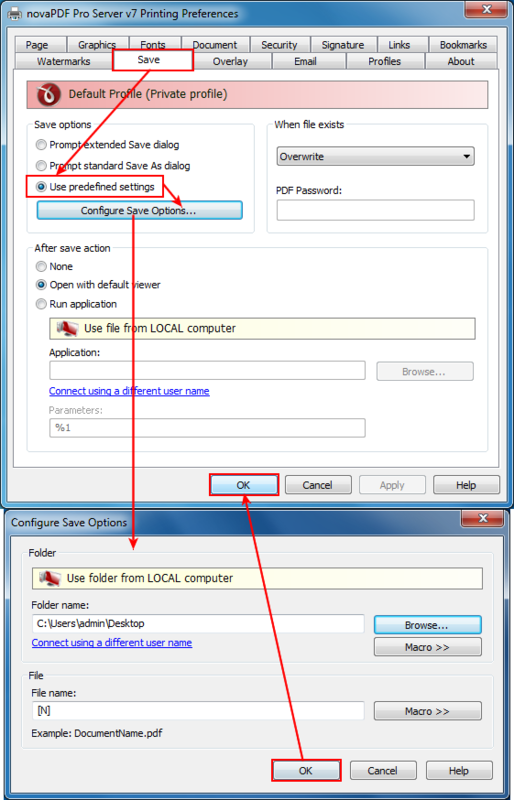 Press OK to save the Configure Save Options settings, and in the Save window if you don't want to set additional options (like the action to take after the PDF was created) click OK to save all the changes.